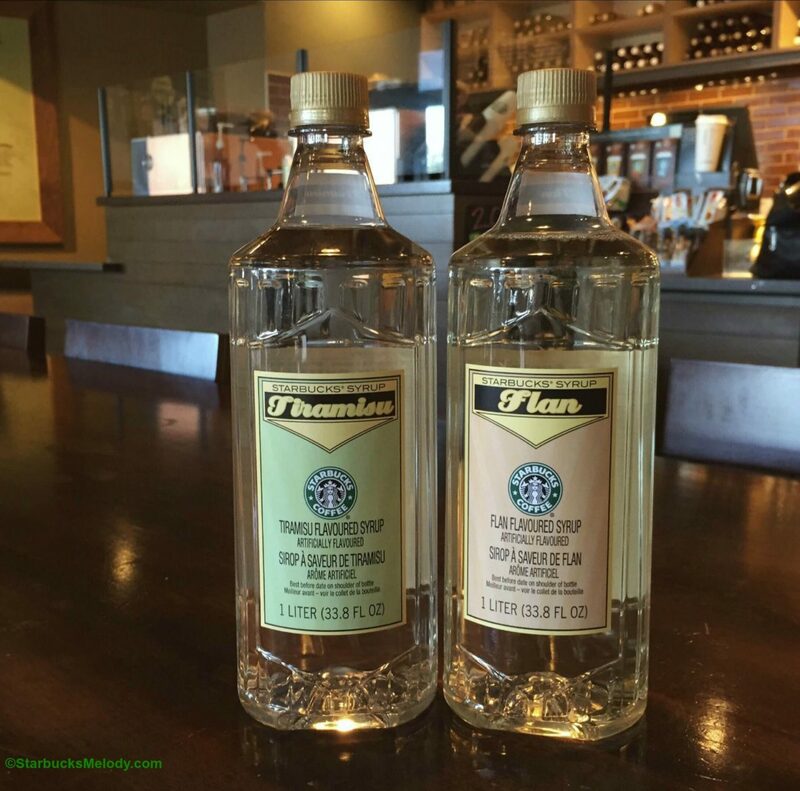 Beginning February 17, 2015, you’ll find some new things awaiting you at Starbucks. A new drink, the Tiramisu Latte, is here along with a returning drink from one year ago, the Caramel Flan latte. Roughly one year ago, in St. Louis and Jacksonville, the Tiramisu latte was a test item – it must’ve done well because now it is a national item! Coconut milk is officially new and available for your latte. 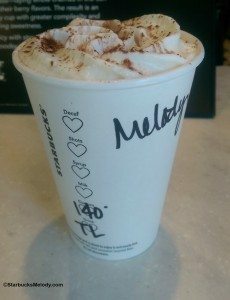 I’ve tried the Tiramisu Latte and reminds a little bit between a cross between Gingerbread and Irish Cream flavors, but leaning more towards Irish Cream. 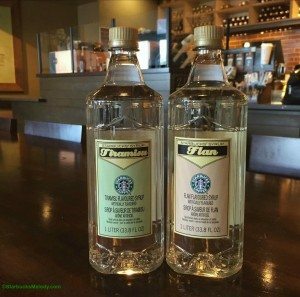 I think Starbucks fans will love it! Also new starting the 17th, there is a chocolate caramel muffin and a double-smoked bacon, egg and cheddar breakfast sandwich. The chocolate caramel muffin is way too rich for me. That, I will not be ordering. That’s a rich dessert. The double-smoked bacon sandwich is delicious, but also a heavy item. It comes on a croissant bun, which makes it a little heavier. I’d enjoy this one if I were especially hungry. Have you tried the new drink. How do you like the Tiramisu Latte? Looking forward to your reviews of the new items in the comments below. I had high hopes for the Tiramisu. It’s terrible. It smells and tastes like cheap booze. 🙁 Tiramisu is my favorite dessert. The latte is gross. @Kristen – LOL – There is a boozy flavor to the Tiramisu latte! I like that description. Some people will love it. 🙂 My regular drink won’t change: Clover brewed coffee! 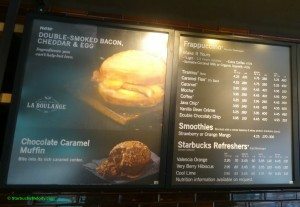 I was at a Starbucks today when they put up the new board sign. I literally was thinking last holiday season that they should have a tiramisu latte! Hopefully I will get a bonus star offer on espresso this week. I like the eggnog latte so maybe I won’t mind the alcohol flavor. Won’t go near the caramel flan though. I hate the slick mouthfeel of caramel in my drink and I can’t stand flan. I love the Tiramisu latte! It’s my new favorite. I’ll give it a shot if I can get a low calorie version. I’ve been trying to go for the healthier options, even at starbucks (like, the low calorie foods, et cetera). I’ve been doing another star dash and I have 2 more to go by the 18th so I’ll probably stop by tomorrow. I was kinda underwhelmed by the tiramisu latte when I popped in this afternoon before the snow started here. 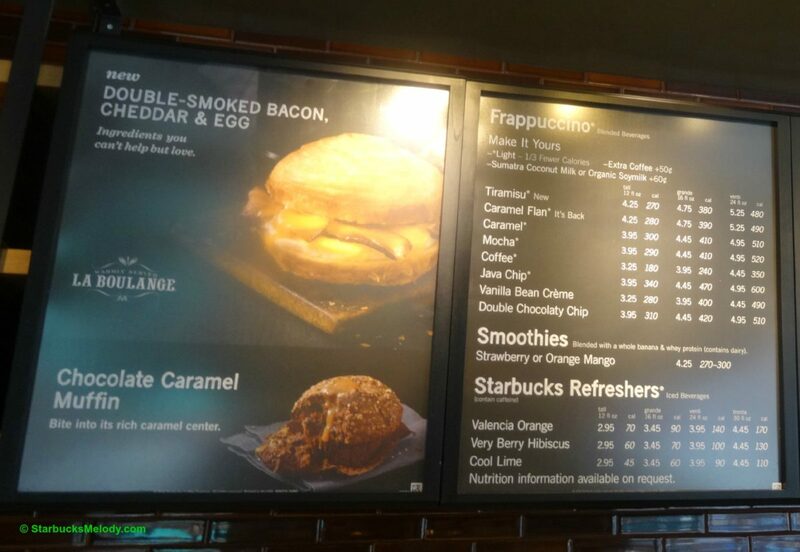 Will try the caramel flan latte tomorrow and see how that fares — especially since I have to stop in for a double-smoked bacon breakfast sandwich. Here’s hoping it’ll start my wintry day off right! I liked it, but it was a little sweet. I’ll try again tomorrow, but with half the pumps of syrup. I usually prefer the flavored drinks with just a hint of the flavor. I want the coffee taste to shine. I was just getting excited about this, then read that Canada is getting the Blossoming Peach Tea Latte instead. Tried the Caramel Flan Latte this morning — VERY caramel-ly, that’s for sure….good, but definitely not something I’d get every day — I think it had so much caramel going on, I lost much of the coffee flavor. It did provide a nice balance, though, to the savory taste of the new double-smoked bacon, egg, and cheddar sandwich — which I REALLY liked. Melody’s right — it’s definitely filling! Love the tiramisu latte but in a frappuccino! Very sweet but super delicious. Tried the tiramisu latte today! I was also underwhelmed with the Tiramisu. It was nice, not too sweet, but it wasn’t any more satisfying than my usual vanilla latte. I didn’t get any alcohol taste, which I didn’t mind, until I hit the bottom of the cup. The store I went to was not my usual. Got charged the grande price for a tall. Not sure if this is at every location. I stayed long enough past the morning rush to get a sample of the iced caramel flan. It didn’t taste like anything but sweet. @Jo, that peach blossom latte sounds amazing! I had to look it up and it’s an EGTL with peach syrup instead of vanilla. It’a too bad I won’t be visiting Canada anytime soon. I love the chocolate caramel muffin. I’m going to have to limit myself to one every two weeks! Or maybe I can just share with my partners instead. So delicious. I really liked the coconut milk when I tried it. It makes the lattes look tanner when I pour steamed coconut milk in a drink. I had an opportunity to try the tiramisu a few times now… all in all it was pretty good. Something great for a slow day. I was really excited to try it. I had high hopes but it’s an abomination that tastes like straight alcohol. Like… literally, EtOH. It’s absolutely terrible. I am sand. I’m right there with you meghan. I also am not a drinker. Since we both like the tiramisu good thing we are not drinkers.. may get us into big trouble. I think these comments (meaning blog comments generally, not just this article) do get read and can provide important feedback to both Starbucks and others wanting to know the consumer opinion of a product! Overall the flavor was good but it really wasn’t as sweet as others have claimed. I’ll give it another shot sometime and see if ithe has a more sweet taste. I rarely drink alcohol but I drink a small glass of a sweet wine now and then. I don’t taste the supposed alcohol taste. Overall I like the drink. I tried the Caramel Flan last year and while I enjoyed it, it just tasted like a caramel latte to me (I didn’t notice anything special with the “flan”), so that being said, I love caramel but I’ll be sticking with the caramel macchiato for now. The Tiramisu Latte I tried this morning and was also underwhelmed by it, as other commenters have mentioned. I wish it was sweeter as I heard some people say, maybe they didn’t add enough syrup? It was just very subtle, but I didn’t taste alcohol like others have mentioned, too. Overall, it was good, but I like my beverages sweeter (especially if I’m going to spend over $5 on it!) I may try the frappuccino version in the near future since I’ve noticed the frappuccinos are generally sweeter and I can taste the syrups more. Was I the only one that didn’t think it had a taste? It tasted like straight up milk to me. Won’t be getting it again. I had a Tiramisu Frappaccino twice this week and they were awesome. One of them I added mocha, and it was good but the mocha overpowered the Tiramisu flavor so I won’t do it with mocha again. I liked just the plain Tiramisu Frappuccino. I have not tried the latte yet. i love tiramisu, as a dessert, and try it pretty much anywhere that offers it. i found the tiramisu latte to be…not good. it was bland, and had a really bizarre, kind of metallic aftertaste. this might be what others describe as boozy, though i wouldn’t have thought to call it that. if i’m really craving a tiramisu coffee drink, though, forza has me covered! theirs is worlds better. So interesting reading everyone’s reviews! I might have to check out the Forza version of this drink! I’d have rather them just bring back the Tiramisu cake pops! Very disappointed in the flavor of the tiramisu latte. Tiramisu is my favorite dessert in the whole world, so expectations perhaps were high. I honestly could not detect any kind of tiramisu flavor. I absolutely LOVE the Tiramisu latte! Tastes great. No alcohol taste either! I really enjoyed the Tiramisu Latte; I’ve probably gotten it three times since it came out. I like that the sweetness isn’t overpowering, similar to the Chestnut Praline Latte. Several of my partners and I agree.. The Tiramisu syrup smells like bourbon.. Every time we pump it into the cups– I immediately think- Bourbon whiskey! I want to know how long this drink is going to go for. I tried it once or twice and LOVED it and then Lent started and I gave up coffee for lent so I have awhile before I can try it again! 🙁 Do you know how long this syrup will be available?